This map from the ARRT (larger image at the link) shows the “preauthorized area” between 24 and 200 nautical miles from shore (within the green boundaries). Within the preauthorized areas, some “avoidance areas” have been reclassified (striped areas) and will require the case-by-case approval. The Alaska Regional Response Team, or ARRT, recently updated a list of areas that would receive extra scrutiny before dispersants are applied to a crude oil spill. The update completes the planned changes to the Dispersant Use Plan for Alaska. The plan is a guide for spill responders, and it spells out how oil spill dispersants would be used during a crude oil spill. The previous dispersant use plan had not been updated since 1989. The first changes went into effect in 2016. Two different processes for deciding whether to use dispersants, depending on the location of the spill, were developed at that time. The application of dispersants is now considered “preauthorized” except for “avoidance” areas. In an avoidance area, a decision to use dispersants must undergo more extensive scrutiny on a case-by-case basis. By pre-authorizing use of dispersants in certain areas, the ARRT can speed up the decision-making time on whether or not to use dispersants. Consultation with U.S. Fish and Wildlife and National Marine Fisheries Services is still required before dispersants would be used in a preauthorization area. For avoidance areas, additional consultation and a consensus between the Environmental Protection Agency, the Department of Interior, the Department of Commerce, and the Alaska Department of Environmental Conservation is required prior to use. There is a short window of time after a spill when dispersants should be applied. Dispersants work best on freshly spilled oil. A vessel sprays water as practice for applying dispersants during an oil spill drill. The Environmental Protection Agency is updating the rules for using chemicals, including dispersants, to respond to oil spills in the United States. This update is intended to address the concerns that arose during and after the BP Deepwater Horizon disaster in 2010. During that disaster, an estimated 210 million gallons of oil was spilled, and over 1.8 million gallons of dispersants were applied to the spill. 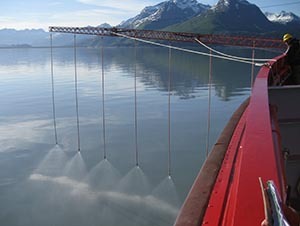 Dispersants are chemicals applied to spilled oil to try to break down the oil into small particles with the hope that these particles disperse into the water column rather than remain floating on the surface in a slick. The Environmental Protection Agency is updating the rules for using chemicals, including dispersants, when responding to oil spills in the United States. The update is intended to address the concerns which arose after the BP Deepwater Horizon disaster in 2010. During that disaster, an estimated 210 gallons of oil was spilled, and over 1.8 million gallons of dispersants were applied to the spill. The EPA is seeking public comments on these proposed changes. The council thinks that this opportunity to comment on these changes is a rare and important event, and we would like to encourage you to add your voice to the public comments. To help you understand the issues and provide your own comments, the council has prepared an overview of our comments.